The Swedish-designed Stiga Park Pro 340 IX is characterised by its remarkable manoeuvrability and ability to access space-restricted areas, and as such will come into its own on lawns with lots of obstacles and landscaping to work around. At its heart is a 570cc Briggs & Stratton Vanguard 18 V-Twin overhead-valve engine with a low-oil shutdown system and dual-element air-filter for exceptional durability in the face of intensive use; and angled ports for a smoother idle; improved fuel-efficiency; and reduced exhaust emissions. Key start makes firing-up the engine a simple process. The Stiga Park Pro 340 IX Ride-On Lawnmower employs an out-front deck design that gives the driver an unhindered view of the cutting-path, thereby ensuring close-quarters cutting around obstacles and along fence lines can be carried-out safely and accurately. The forward-mounted deck also delivers a more consistent finish than a mid-positioned deck, as the grass is cut before it’s flattened by the wheels (a choice of decks is offered). This high-specification hydrostatic four-wheel-drive on the Stiga Park Pro 340 IX makes it possible to traverse terrain that would defeat a two-wheel-drive machine; and has a separate hydraulic pump that produces a rapid top-speed of 11km/h via a heavy-duty Kanzaki transaxle. Ground-speed adjustment is in infinite increments with no clutch or need to stop to shift-gear. Boasting fully articulated steering, whereby the chassis pivots at its mid-point, the Park Pro 18 is hard to beat when it comes to manoeuvrability – obstacle negotiation and end-of-pass turns can be carried-out with ease. The pivoting chassis also ensures the back-wheels follow exactly the same line as the front-wheels, so you won’t gave to worry about the rear-end of the mower clipping anything. So as to maximise driver-comfort, Stiga have equipped this model with an adjustable high-backed seat that’s mounted on a parallel suspension; and effort-saving hydraulic servo steering. A powerful LED headlight means you’ll be able to keep working in low-light conditions; while an hour-metre lets you see when a service is required. Also featured is an adjustable height-of-cut, which you can set to any of ten-stages between 25 and 90mm (depending on deck); and a hugely capacious 14-litre fuel-tank that works to keep downtime to a minimum. You can chooise between these combi decks: 95cm manual lift; 95cm electric lift; 100cm electric lift; 105cm electric lift; 110cm electric lift). Manoeuvrability; functionality; comfort; and user-friendliness are the hallmarks of this innovative, European-built ride-on from venerable garden-machinery specialists Stiga. Its remarkable agility is thanks largely to its articulated steering system, which firstly means you’ll no longer be restricted to mowing up and down in straight lines; and secondly will enable you to negotiate landscaping and garden obstacles with speed and efficiency. The pivoting chassis also ensures the back wheels track precisely the line of the front wheels, so you can focus on driving rather than worrying about what’s happening to the rear. The forward deck-positioning on the Stiga Park 740 PWX Ride-On Lawnmower brings two clear advantages over the classic mid-deck configuration – the cutting path is clearly visible, so you’ll be able to mow with greater precision; and the grass is cut before it’s laid flat by the wheels, thereby ensuring an impressively consistent finish (a wide selection of Combi decks is offered). The Stiga Park 740 PWX boasts a four-wheel-drive transmission, which means you’ll have no trouble working on steep slopes or in adverse whether conditions. The drive is hydrostatic, giving you infinite-increment ground-speed control, which works to further enhance manoeuvrability. 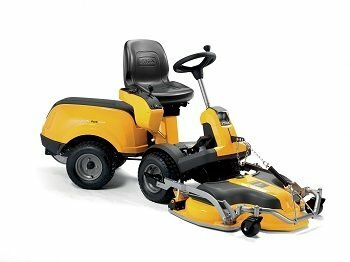 A split differential works to eliminate turf scuffing, important when working on a fine lawn; while power-assisted steering and an adjustable seat combine to ensure high levels of driver-comfort. The high-end features don’t finish there – power is supplied by a premium-quality Briggs & Stratton twin-cylinder key-start engine that’s characterised by its low-noise, low-vibration operation; and superior fuel-economy. As with all B&S power-packs, reliability is not in question. There’s also a capacious 12-litre fuel-tank that works with the fuel-efficient engine to provide lengthy run-times between each top-up break; and an hour metre that allows you to check at-a-glance when a service is impending. The following rear-discharge and mulch-capable decks are available: 95cm Combi 2 Bladed Deck; 95cm Combi Electric 2 Bladed Deck: 105cm Combi Electric 2 Bladed Deck; 100cm Combi Electric 3 Bladed Deck; 110cm Combi Pro Electric 2 Bladed Deck. 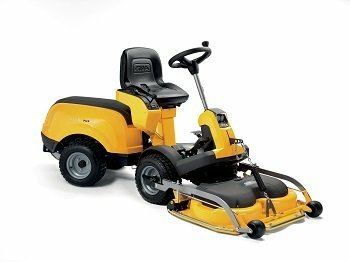 Offering a desirable combination of diesel power with high-end Swedish engineering and innovative design solutions, the superb Stiga Park 540 DPX will impress even the most experienced user of ride-on mowers. Thanks to its innovative articulated steering system, whereby the chassis pivots midway between the front and back-wheels, the Park 540 DPX excels when it comes to obstacle negotiation, and can be quickly repositioned at the end of each pass. In addition, because the rear-wheels follow precisely in the path of front-wheels, you’ll be able to keep your eye firmly on the cutting-path, rather than worrying about the back half of the machine tipping into flowerbeds or catching obstacles. The Stiga Park 540 DPX Ride-On Lawnmower employs an out-front deck design that firstly cuts the grass prior to the wheels running-over it, which will deliver a classier finish; and secondly gives you a clear view of the deck so you can mow with greater accuracy. Equipped with an infinitely-variable four-wheel hydrostatic drive, the Stiga Park 540 DPX will take challenging terrain in its stride and can be driven at a speed that’s most suitable for the grass-conditions you’re faced with. It has a split-differential and wide-profile tyres, so you can be confident you won’t cause turf-damage when turning on formal lawns; and it boasts hydraulically-assisted steering that works with the adjustable driver’s seat and ergonomically positioned controls (PTO clutch; deck lift) to ensure time-consuming jobs won’t prove overly tiring. Powering the Park 540 DPX is a 517cc Hatz 1B540V engine; a premium-grade single-cylinder diesel unit that features a forged-steel crankshaft and pressurised lubrication for superior longevity; and which boasts an electric key starter for stress-free ignition at each time of asking. Also featured is an hour-metre that will let you know when a service is coming-up; and a large-capacity 12-litre fuel-tank that increases productivity by reducing the number of refuelling stops. 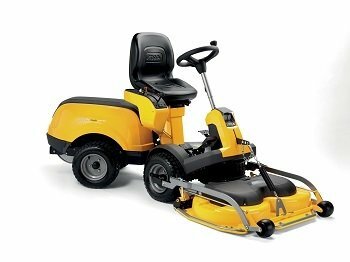 Combining Swedish brand Stiga’s famed build-quality with advanced ergonomics and a host of high-spec features, this innovative front-cut ride-on will make the task of large-scale lawn maintenance a whole lot less demanding. What really sets it apart from its multitude of competitors is its articulated steering system. Giving a super-tight turning-circle of only 246cm, this impressive feature makes the negotiation of intricate borders and closely-spaced obstacles simple; and, because the back-wheels follow the line of the front-wheels, there’s no chance of the rear of mower catching on anything. Also making it stand out from the crowd is its out-front deck positioning, which firstly gives an unhindered view of your intended cutting-path for precision mowing; and secondly makes it possible to mow under bushes and low, overhanging branches – areas you wouldn’t be able to reach with a conventional mid-deck machine (a choice of decks is available (95 / 100 / 105 / 110cm), all of which can either mulch (recycle) or rear-discharge your clippings). 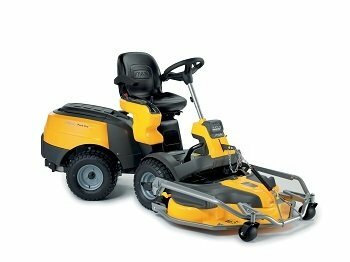 The Stiga Park 720 PW Ride-On Lawnmower has been equipped with an infinitely variable foot-pedal controlled hydrostatic transmission that works with the articulated steering to make it a pleasure to drive. An adjustable seat; adjustable steering wheel; and power-assisted steering combine to ensure fatigue is kept at bay for the duration of the task; while electronic height-of-cut adjustment means you won’t have to waste time dismounting when you want to change the blade position (the cutting-height can be set to any of ten positions between 25 and 90mm). Making the Park 720 PW tick is a very high-powered 570cc Briggs & Stratton Vanguard twin-cylinder engine that employs the American manufacturer’s groundbreaking overhead-valve technology so as to keep fuel-costs; noise; and exhaust emissions to remarkably low levels. A V-Twin configuration ensures smooth, low vibration performance and linear power-delivery; while electric key start means firing-up the engine couldn’t be simpler.